Electra Townie: An innovative urban commuter model. The Electra Townie is a bike that is perfect for a casual cruise around the town. It is made for urban areas, and is priced so well that you won’t even need to worry about it cutting into your budget at all. The Townie is a lot of fun to ride around, and can be a great machine for anyone. Huge – this was the first adjective in our minds when we took a look at the Electra Townie. It isn’t a bike that can be easily stored in an apartment, because it is bulky. 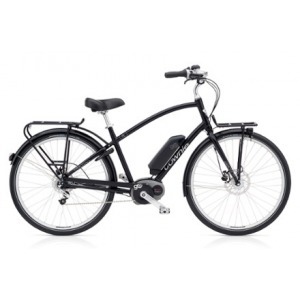 It makes use of Electra’s very own Flat Foot Technology, which enables anyone to stand on the bike with their feet flat on the ground, while providing a full upright pedal reach at the same time. Made out of a great 6061 aluminum alloy, this bike had a steel fork to complement it. All of this sounds like it weighs a lot, but it weighed about 13kg when we looked at it. We also noticed that the bike had smooth routing of cables on the inside of the tube, with mounts for mudguards and bike racks provided as well. The derailleur of this bike was a Shimano Tourney TX, with a Revo shifter, KMC chain and more. If you are looking for a bike that can take the stresses of smaller rural roads while being a great casual ride around town, this is for you (as long as you don’t have many hills to climb). Overall, the Electra Townie is a bike that is bound to serve you well in terms of comfort, but it isn’t the greatest when it comes to power transmission or overall speed. It is, to the very depths of its soul, a casual urban rider.